Consumers expect a premium service experience from IT, an experience that enables them to boost their productivity and support their needs anytime and anywhere. And the more this experience looks, feels and functions like the consumer channels they use, such as Amazon and Facebook, the more it meets their expectations for optimal IT service delivery. 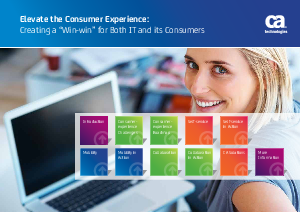 This paper explains how IT can demonstrate its strategic value by improving satisfaction, reducing costs and increasing productivity for both IT and its customers—creating a win-win situation for all.